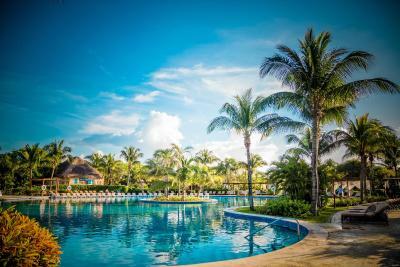 Lock in a great price for Valentin Imperial Riviera Maya All Inclusive - Adults Only - rated 9.4 by recent guests. This hotel could not be any better! 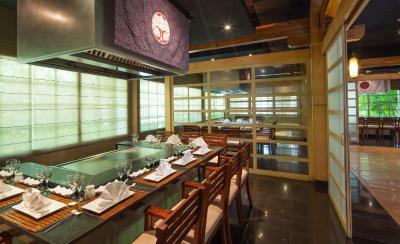 The restaurants serve delicious high quality food and are amazing, the bars are great and the drinks are strong. The rooms look really nice and the staff is so super friendly, it is amazing! This place is unbelievable, I’ve never been to a better hotel and will for sure come back! 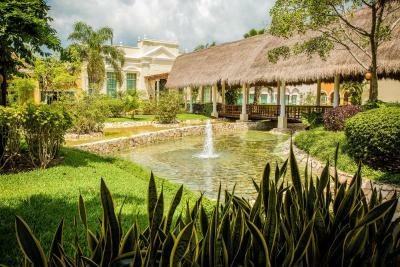 The staff deserves special recognition for making this grand place truly outstanding; from housekeeping to the gardeners, the resort was immaculate. It was a special experience to walk around in the evening with lights on the grounds and Spanish guitar playing in the background. The food and entertainment was excellent. Everyone, concierge, bell boys, waiters and even the grounds people that maintained the landscape were warm and welcoming. Amazing hotel with fantastic staff and premises! Everything was simply perfect! Noemi from the breakfast team is really outstanding! Room was comfortable and staff were friendly. The facilities were good and the resort was very well kept and run. The beach was good and also I really liked the eco friendly attitude of the hotel and in particular the turtle protection program on the beach. Food and drinks were generally good although whilst some restaurants such as the Mexican Hacienda and French Olivo were very good .. we found that some of the others did not have authentic tasting food and despite the great atmosphere and service they lacked flavour and taste. Presentation was always good .. but the food was VERY MUCH DESIGNED for AMERICAN TASTE .. IE BLAND ! 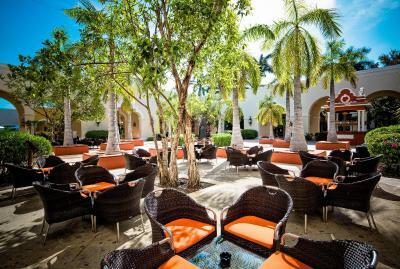 The resort gives the feeling of super exclusiveness from the start. 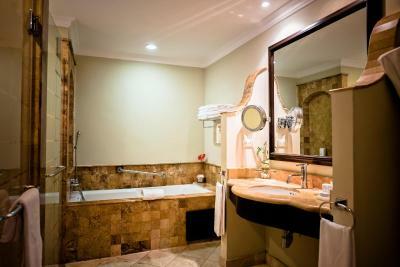 Having a wet towel ready for you on arrival is just the beginning of a long list of pampering. The staff is helpful beyond words and looking to make the stay as comfortable as humanly possible. I couldn't ask anything that wasn't addressed immediately. The restaurants are top notch. The serving, the quality, the ambient all exceed every expectations. The beach is kept very clear even with the large amount of seaweed which was washed up to the shore. Beautifully landscaped property with stunning architecture, sparkling pools romantic winding paths. The beach was our favorite. 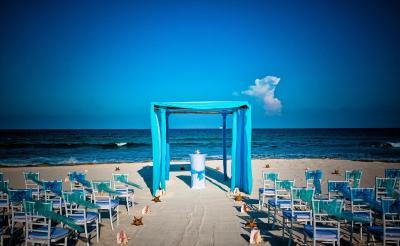 We did not purchase the priveledge package so paid an extra $40 per day to rent a private beach cabana. Waitstaff brought cold drinks all day and we lounged, sunned and swam in the beautiful Carribbean all day. Room was quiet and large with the softest bed. Everything was five star quality. I recommend arranging a private transport to and from the airport ahead of time so you don't have to deal with confusion as you step off the plane. The food was fantastic! Our favorite was Hacienda. We had the best 15th wedding anniversary and definitely plan to one day go back. 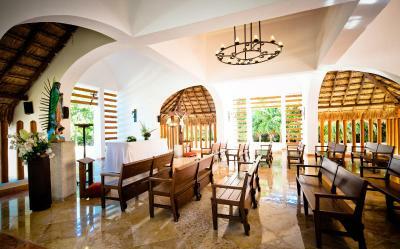 One of our top picks in Puerto Morelos.Nestled on a one-half mile stretch of private beach in Playa Secreto in the Riviera Maya, this only-adult, all-inclusive resort offers spa services and a variety of on-site dining and entertainment options. 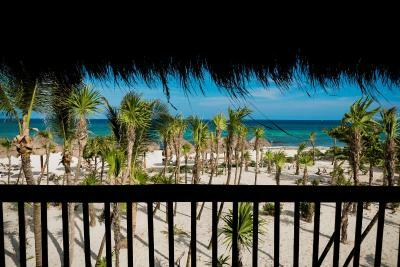 Valentin Imperial Maya All Inclusive is an environmentally friendly property and features rooms with jetted tubs and balconies. The rooms offer free high-speed internet access as well as iPod docking stations. 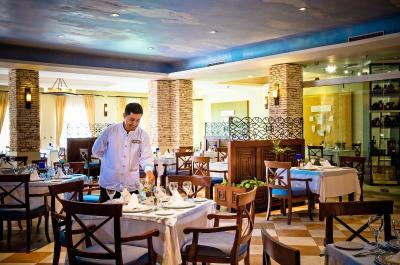 Breakfast and lunch are served at the beachfront à la carte restaurant. 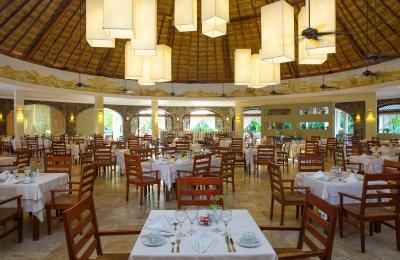 The resort's main buffet restaurant serves breakfast and lunch. 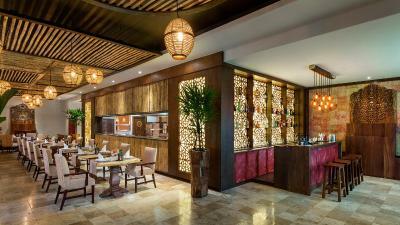 For dinner, guests can choose from 7 a la carte restaurants, which serve Italian, French, Japanese, Indonesian, Mexican, steak dishes and seafood. The property arranges kayaking, snorkeling or scuba diving. On spot, guests can relax with a massage in the full-service spa. Among other features are an outdoor swimming pool and tennis courts. 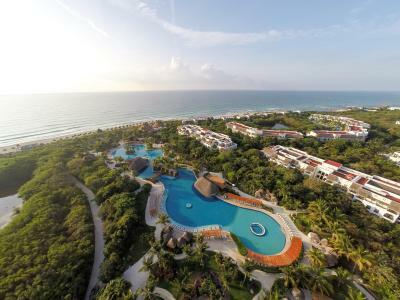 Valentin Imperial Maya All Inclusive is located 25 minutes' drive from International Cancun Airport, 30 minutes' drive from Cancun and only 20 minutes' drive from Playa del Carmen. 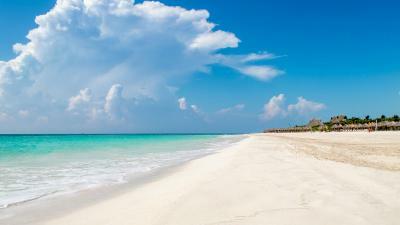 This property also has one of the best-rated locations in Puerto Morelos! Guests are happier about it compared to other properties in the area. 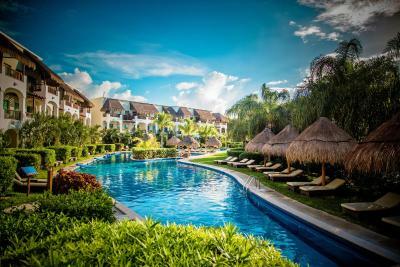 Valentin Imperial Riviera Maya All Inclusive - Adults Only has been welcoming Booking.com guests since 9 Jun 2009. 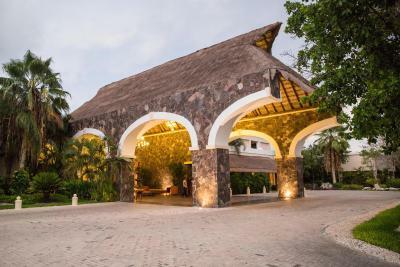 When would you like to stay at Valentin Imperial Riviera Maya All Inclusive - Adults Only? 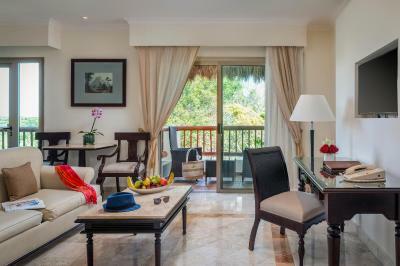 This air-conditioned suite features garden views and balcony or terrace. It is equipped with either two double beds or one king. The bathroom features a hydro massage bathtub and single vanity. 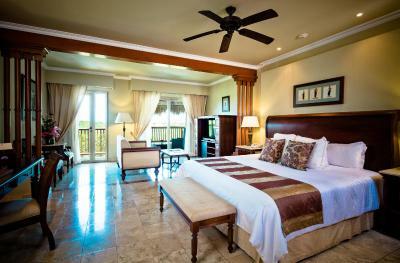 This air-conditioned suite features pool and lagoon views from the private furnished balcony. 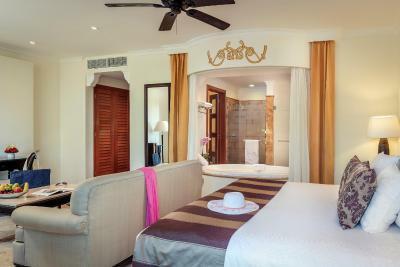 This suite offers two double beds or one king. Bathroom equipped with an oval double hot tub and bidet. There is a large seating area with a TV. 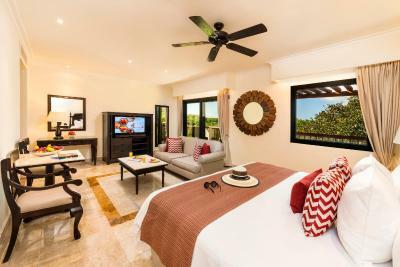 This air-conditioned suite features a partial ocean view and a balcony or terrace. 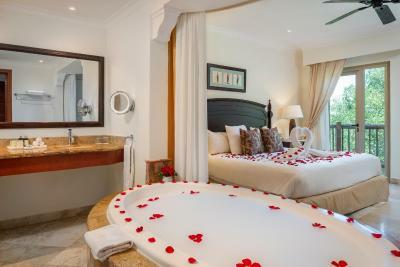 It features a king-sized bed and separate bathroom with shower. 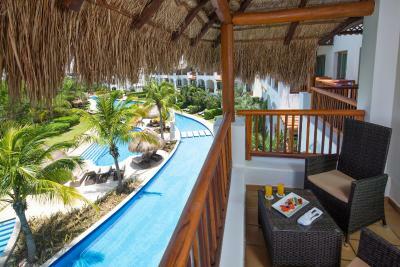 The ground floor rooms have a hammock and sliding glass doors a few steps from the sand. Located on the ground floor, this Junior Suite is equipped with a spacious terrace, a double hot tub separates the bedroom from the bathroom with bidet. It has a large seating area with a 2nd TV. 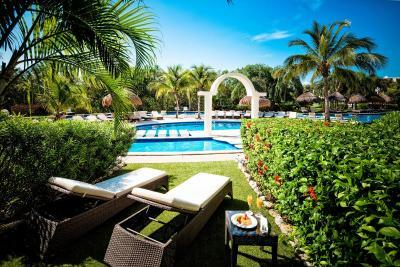 These ideally situated suites are directly in front of a pool with only a patio, a patch of grass and two lounge chairs separating the suite from the welcoming water. Perfect for the guest who wants to feel as if the pool is an extension of their suite. 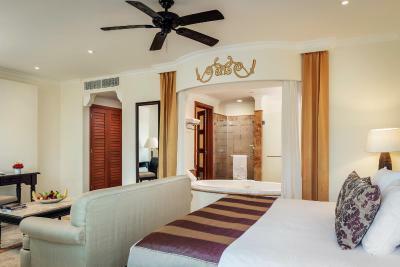 This suite features a balcony or terrace, one-king sized bed and a double hot tub that separates the bedroom from bathroom. 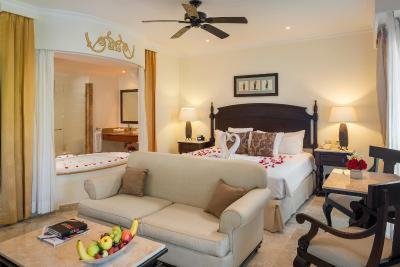 A beautifully appointed junior suite for guests who want to be close to the restaurants, lobby and pool. This suite has a balcony, iPod dock and minibar. This double room features a hot tub, air conditioning and minibar. House rules Valentin Imperial Riviera Maya All Inclusive - Adults Only takes special requests - add in the next step! Valentin Imperial Riviera Maya All Inclusive - Adults Only accepts these cards and reserves the right to temporarily hold an amount prior to arrival. Please note that the property has a specific dress code. The property will contact you with more information. Night Elegance: Ladies: Dresses, blouses, skirts, dress jeans (not torn nor ragged), Capri pants, elegant Bermudas, dress shoes & elegant sandals. ***Beachwear, sportswear, t-shirts, short-shorts, tennis shoes or beach sandals are not allowed. Gentlemen: Long pants only (includes elegant jeans, not torn nor ragged), shirt with collar and long or short sleeves (it can be a polo shirt, a classic shirt, as long as it has a collar and sleeves), elegant shoes. ***Beachwear, sportswear, 3/4 pants, Bermudas, t-shirts, tennis shoes, tank tops or sandals are not allowed. Sleeping pillows, beach lounge chairs, shower leaked all over bath mat, pool songs with inappropriate lyrics, the strong fragrance in the check-in building. Great selection of foods, delicious restaurants, music playing on speakers while walking through property, activities offered, beach massages, great staff-so friendly, special acknowledgements(our anniversary noted in bulletin, swan towels and rose petals on our bed, bottle of champagne), small gestures: chocolates with turn-down service along with bottled water and a glass, and a mat laid on the floor next to bed. Loved the attention to detail and truly felt pampered our entire stay. The customer service was excellent. The food was delicious. Our room was spacious and romantic. The jacuzzi needs roughly 45 minutes to fill up, which was a little too long in our opinion. Except for this everything else was absolutely outstanding! 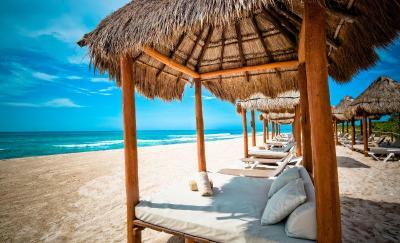 The only constructive criticism I have is there needs to be more cabanas in the pool and on the beach area. People leave there items there overnight to claim premium spots the next day. Staff and property were perfect. I want to single out Angel for being one hell of a guy. He and his staff are the back bone of the resort. Every staff I came across greeted me. Hats off to the housekeeping staff. They cleaned my room twice a day! The grounds crew keeps the landscaping picture perfect. I was there for a wedding and it was like being in a movie. Security was solid. You weren't getting in or out of that place unless they said so. Roaming guards at night on the beach which made me feel safe. Everything is included people. Top shelf alcohol and the food was the best I've ever had. Just bring lots of dress clothes (trust me you want to look good at this kind of resort) and your swimsuit. Don't I forget lots of sunscreen because the sun is intense down there! I totally look forward to coming back. Cheers guys! The food at the other restaurants is not very good and can be improved. Although there are signs everywhere that warn against reserving beach chairs, everyone does it. If you get to the beach after 9:00 am, there is no way you’ll find an empty one until well past noon. The staff and the property are amazing. The beach and impressive pool are gorgeous. I didn’t pay the Privilege package and after staying at the hotel, I wouldn’t. Food at Le Marche, La Hacienda and Mar y Tierra are delicious. 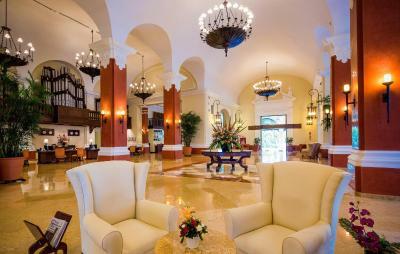 Tip: I stayed in block 3 and felt it was very conveniently located, close to the beach and restaurants. Breakfast was just ok. And would have liked to have a very casual restaurant option where beach wear would be acceptable on the evening instead of a nice dinner. Maybe a basic dinner buffet. Room service was cold in the morning and at night it had no flavor. Disappointing. Superb all inclusive option! The grounds and gardens are truly impressive! Restaurant options for an all inclusive are amazing and not having to have reservations and not having to wear bracelets is a huge plus. overall for the value and for an ai, this is a phenomenal hotel. Loved the nightlife and bands and dancing the night away with the dj. But if you wanted quiet that was easy to find. The organization of dinners is extremely confusing and frustrating. If you are VIP (paid service) you are entitled to make a reservation. If you are not, no reservations are possible. When you come to any restaurant between 7:00-8:30, it will most probably be “full” so they give you a beeper and ask you to come back in 40 minutes to one hour. Some quests were fine with such a system, for others it was unacceptable. Mainly for the reason that there were always several tables available. When we asked who are these tables for, we were told there were “reserved”. But even during our one to two hours stay there were still available so they could be used. As it was not reasonable for us to wait in a half-empty restaurant and especially in a 5* hotel, we managed to always make a reservation via our concierge Eduardo and Esperanza to whom we would like to thank for their kindness and helpfulness. If you push, staff will help you, otherwise we would dine at night every evening. I do believe that there should be a dinner buffet available to all and it should be mandatory to make a reservation to all restaurants if guests wish to visit. Because with this system there was always a confusion and many guests left upset and dissatisfied (including us first two nights). One day before our departure we have booked a taxi with our concierge, nevertheless, when we left a reception the porter had no clue about any reservation. Not very pleasant situation at the end. Luckily, as we came 15 minutes earlier, so we managed to leave on time. The resort is just amazing. 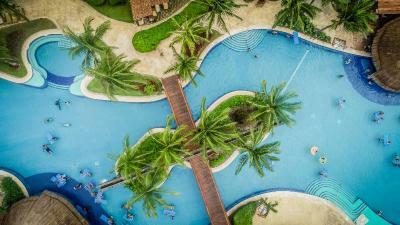 There are several pools which are enormous, plenty of bars, restaurants, just everything you really need. The beach is beautiful as well as the ocean. There were always enough sun beds. There are waitresses on the beach always helping you and bringing you whatever you want. Although some quests in the previous reviews complain about the seaweed, there is a tractor going from one side to the other all day long picking up the weed - furthermore, the seaweed does not smell bad, it is more like grass/flowers from the sea. The breakfast in both restaurants is excellent, large variety of food and beverages. Staff are extremely helpful and nice. Regarding the restaurants which you need to visit for a dinner (no buffet available), Indonesian and Japanese are the top. The activity center/ diving center by the pool is just great - they offer many trips and other activities. I would like to thank to Paul for his help and friendliness. We booked turtle snorkeling trip which also included a stop by gorgeous cenote (highly recommended!!) for about 70/80 dollars - great value for money. I would like to thank to Francisco(tour guide) and our driver Edie. I have also booked a scuba diving trip which is just great even for first-timers with an amazing instructor Erik. We have also booked a private transportation to Chichen Itza and we could not be more satisfied. The driver takes you wherever you want. 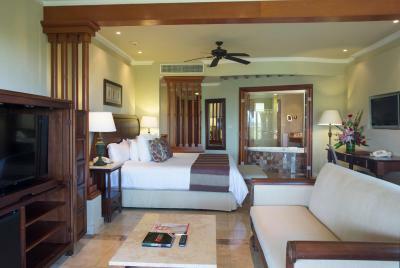 We have booked Emerald Junior Suite which is spacious room by the beach. The beach is about 20 meters away so it would make a sense to book a standard room, but anyway, it was nice. You really don’t have a sea view due to palm trees as we had a ground floor room (although we have requested first floor), but it was not such a big issue. Anyways, rooms would deserve a decent reconstruction. As the resort is enormous it is nice that during dinner times there are golf carts giving you a ride. But it is not a rule. Air conditioning didn't work too well. Lunch was sub par. House wines were terrible. Breakfast was good. Dinner was excellent. Staff was wonderful. Grounds were beautiful. Check In takes longer than normal. Party music at main pool only when the GO Team is out for activities so it can be kind of quiet. Great restaurant choices. Friendly staff. Top shelf liquor. We paid an extra 100 US. 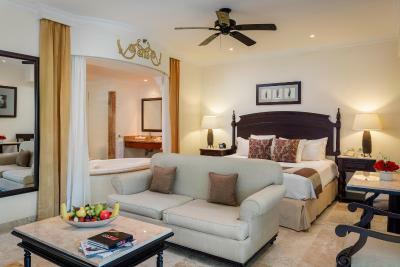 Per night To upgrade our room, which would give us a larger room and an area of our own to lounge in front of the pool. Sadly it was shady there so we never used the lounge chairs.We had to race out early in the morning to put our towels on the preferred lounge chairs by the pool. So it wasn’t really worth the upgrade. If you want the cruise experience on land then this is the place. There is only one ATM and if it’s broken then you have no other option and you feel horrible for the staff who follow you waiting for a tip. The facilities are clean and well maintained. The property is huge and the beach is lovely.